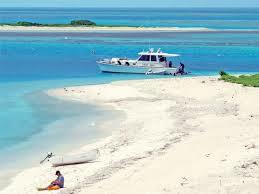 To the west and north of Merida 30-40 kilometers (18-25 miles) lie quaint fishing villages. Unspoiled beaches lie in either direction. The Gulf of Mexico here is warm and shallow. The tide is gentle. Dolphins play in the water, sea turtles breed in the shallows. 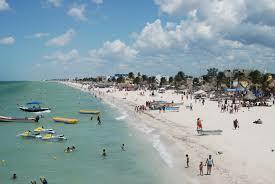 Many Canadians vacation yearly in Progreso. It is quaint, quiet, and inexpensive. 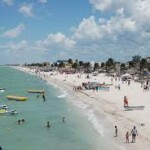 The Malecon stretches along the beachfront of Progreso. A fine white sand and gentle waters lie on its north side. Restaurants, shops, and discos line its south side. Cruise ships slide by and dock at the Catalina-style wharf which extends 4 miles into the ocean. The mystical water is sanguine blue with a soft sandy bottom. 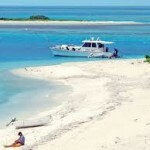 Near Progreso is found the Alacranes reef and Perez Island. An excellent road takes the traveller east along the Gulf coast through Chichulub, Chelem, Telchac, Santa Clara, Dzilam de Bravo, and many other sleepy fishing pueblitos all the way to the Rio Lagartos Wildlife Refuge. 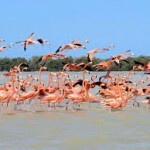 More than 300 bird species occupy the Yucatan. 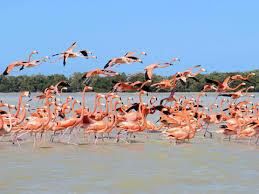 The most famous , flamingos, adorn the natural parks at Celestun and Rio Lagartos year around. 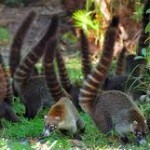 Celestun is just an hour drive west from Merida. Herons, ibis, cormorants, albatross, and pelicans can be found all along the coast. and turtledoves, among others. 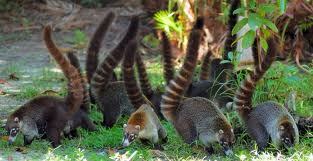 A list of other inhabitants includes crocodiles, coatimundis, foxes, skunks, white-tail deer, agoutis and jaguars.